The portable version of LoginCode has been developed for people who normally use multiple computers and need an access to their personal data at any time on any of them. Portable version may be installed on any external drive (flash drive). It does not modify your system in anyway. The program database is also stored on the same disk so when you need to log on, all you have to do is to insert your disk into the USB port and start the LoginCode. 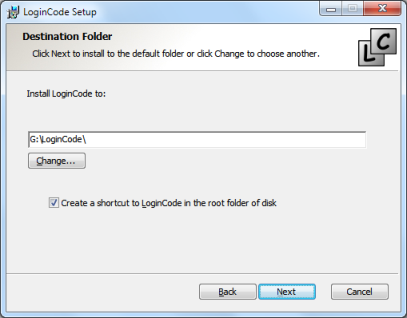 To install the portable version, launch LoginCode setup package. The setup package can be obtained from program download page. Please note that if you want to install the 64-bit version of LoginCode in portable mode, you will be able to run it on 64-bit machines only. When you run the package, you'll be prompted to choose the type of installation. To install the portable version of the program, select Portable installation. The following image shows installation wizard while choosing the type of installation. In the next step (see the image below), choose the target folder for your LoginCode. Press Next when you select the target folder. Complete the installation according to the Installation Wizard hints. 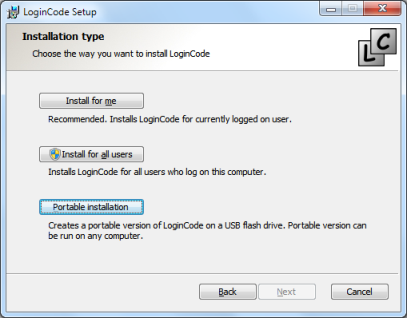 When installation is completed, you can run the portable version of LoginCode directly from the folder, you have selected. Portable version displays a flash drive icon in the upper left corner of the main window so you can distinguish it from the regular version. 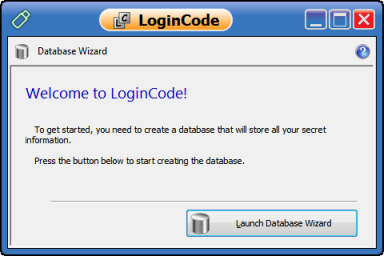 The picture below shows main window of portable version of LoginCode. To get started, press Launch Database Wizard. Database Wizard will guide you step by step through the process of creating a new database. After completing the wizard, LoginCode will be ready to work. If you have previously used the non portable version of LoginCode and want to use its database, you need to copy the database to external drive. By default, the database of non portable version is stored in Database.lcdb file in My Documents directory. Copy the file to the same folder that you have selected during the installation of portable version. 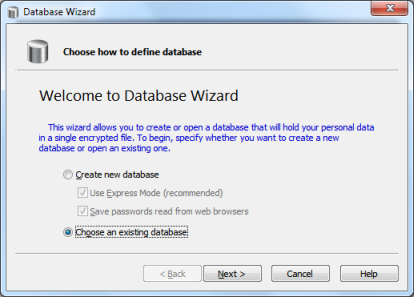 Then launch the Database Wizard and choose the copied file by selecting Choose an existing database option. The picture below shows which option you should use. After completing the wizard, you'll be able to work with LoginCode.